KOKOMO – In the span of five days the U.S. Senate campaign came here to the City of Firsts. Republican Mike Braun spoke to business folks at a Rotary Club meeting in a country club. Democrat Sen. Joe Donnelly talked to a small gathering of auto workers at a UAW hall on Friday. These were late summer ramblings in a race that could determine control of the U.S. Senate, with future Supreme Court nominees and President Trump’s agenda, or, possibly, the fate of his presidency hanging in the balance. This race is a tossup in the estimation of Howey Politics Indiana, Sabato’s Crystal Ball, the Cook Political Report and Inside Elections with Nathan Gonzales. It could go either way, with at least $100 million expected to spill in. Braun expects $10 million to be spent by his and the Donnelly campaign each, with another $35 million to $40 million and likely more to come from Super PACs and advocacy groups. Hoosier U.S. senators have come from the U.S. House (Dan Coats, Dan Quayle, Todd Young and Donnelly) or were mayors (Richard Lugar and Vance Hartke), the General Assembly (Birch Bayh) or the governor’s office (Evan Bayh). If elected, Braun would be the third school board member (Sen. Donnelly was president of the Mishawaka Marian board) and second legislator to climb that ladder in the television age of Indiana politics, joining Lugar and the elder Bayh. Braun’s pitch was that he went to the General Assembly and worked on big things as a freshman. “I passed a bill because in my area, we had bad road infrastructure. I had the idea that rather than relying on Indianapolis, we’re going to try and initiate our own road funds,” Braun said. “I’ll never forget Chairman Tim Brown and Chairman Ed Soliday … told me, ‘Mike, this is an ambitious project. You need to do your research and it will take two to three years to get it across the finish line.’ One thing you learn as an entrepreneur is you always listen to everyone, take the advice and then run with the best you’ve got. “I didn’t have the patience to wait two to three years,” Braun said. “Don’t always ask something to be done for you. Put your own skin in the game, initiate, and control your own destiny as the result of it. We got that thing through, Sen. (Mark) Messmer and I, in one year. We were told to do it in one chamber, not both. We respectfully listened, and then did it in both. Donnelly’s pitch to the UAW came, literally, with a story of family skin in the game. Braun’s pitch to voters is with a business-like, matter-of-fact and status-quo challenging demeanor, with the tenor of a curmudgeon. He explains things well. In addition to the $100 million likely to spill in, the Donnelly-Braun showdown will be fought over the several key issues. There’s Obamacare and what Donnelly calls the “sabotage” of the ACA, while Braun says his “real world” business experience gives him the tools to actually craft a market-based plan that will work. “I could walk into that Senate and probably know more about what to do than anybody that’s there,” Braun told me as we drove from Kokomo to Delphi. 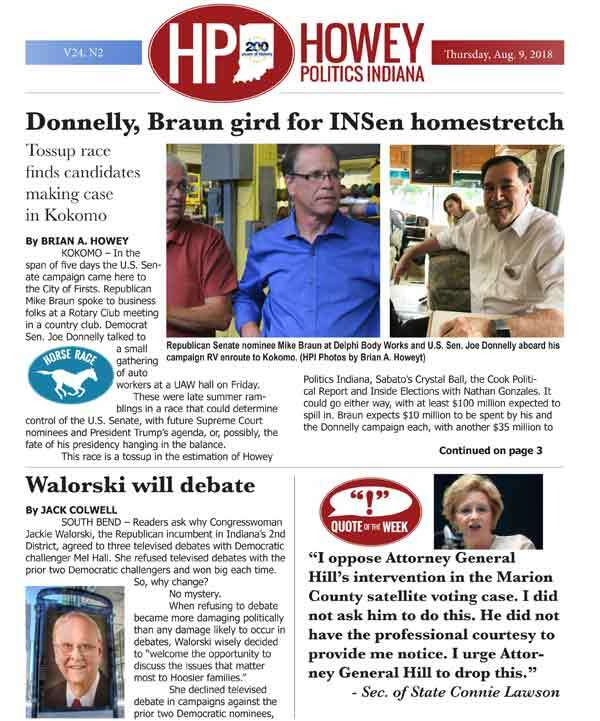 Braun believes he is carrying a “positive” message, decrying Donnelly and the Super PACs for targeting his business, Meyer Industries, with “lies.” Donnelly emphasizes his work for his Hoosier “bosses” and claims he’s not beholden to presidents and special interests. Braun believes that Trump is playing the “long game” to rectify trade patterns that were instituted after World War II decades ago. “I’m hoping, and I believe, President Trump and those who are working with him hope it ends up addressing these baked-in problems without causing too much grief along the way,” Braun said. The obvious wildcard also aligns with President Trump, with the Russian collusion investigation of Special Counsel Robert Mueller throbbing just below the surface. Neither Donnelly or Braun can forecast how this could course through their campaigns or what the potential impacts could be. It is home to the most important U.S. Senate election this cycle. HPI Horse Race: Tossup.